I’m a happy camper with my newly finished Ephemeris wrap in two shades of Mondim sock yarn. For me, this is Pom Pom project number 3 (the Riley top being my first and Moondust Mittens my second)! The Ephemeris shawl / wrap pattern is from Pom Pom Issue No. 23 (Winter 2017) and I can’t remember if my main motivation in choosing this pattern was that I really wanted to make the pattern itself (because it is extremely beautiful, after all) or that I really wanted to find an interesting pattern to showcase Retrosaria Rosa Pomar’s Mondim Portuguese wool (nylon-free) sock yarn. Likely a combination of the two! It was my extremely good fortune to be able to visit Retrosaria Rosa Pomar in Lisbon last fall (which has to be one of the loveliest yarn shops around) and I really wanted a souvenir of the visit and the chance to try knitting with Portuguese wool! The Mondim yarn label is (and all of the illustrated labels of the yarns in Rosa Pomar’s yarn collection are) super delightful: a person’s legs wearing lovely lace socks beneath a pleated skirt. Feeling rather bold, I picked highly contrasting colours, including a mustard yellow (a shade I adore but have never worn), and set about making my own Ephemeris. Having picked this more rustic and non-superwash yarn, I definitely did not get the same shiny, vibrant, saturated colour in the final product that the recommended yarns (Hedgehog Fibres or Malabrigo superwash sock yarn) would produce. This shawl / wrap has been an enjoyable knit. There is some nice garter stitch to facilitate relaxing TV knitting; the striping and diamond pattern added interest and were, I found, straightforward enough that I could do a lot of it from memory or from reading the previous row. This is a pattern that looks more impressive than it is: there is no colourwork required because the colour pattern is achieved through slipping stitches. You never work with more than one yarn at once. Mondim is a lovely yarn to knit with. It has a great squish factor: springy and strong. Garter stitch has not been my favourite knitted texture, but *oh my* does Mondim knit up beautifully in a simple garter. I have one other skein of Mondim in a white/speckled colourway that I’m planning to turn into socks. I still have a bit of the mustard and navy left over after finishing the shawl and might try them out at contrasting cuffs/toes/heels. Stay tuned! I got properly into knitting in 2018. This is my 2018 project list with some reflections on each project I completed this year and what I learned. I also included the places where I purchased the yarn because projects 5-9 map out what has been a really fun exploration of lovely local UK yarn shops. (Top left to right: Tiny Flax sweater, Age of Brass and Steam, and Textured Shawl; middle left to right: Riley tee, birthday socks, and simple slippers; bottom left to right: weaving sample, Traigh shawl, and Moondust mittens. I succeeded in my goal of knitting something for a baby in time for their birth. I can see how baby garments are satisfying to knit: so quick and so cute and little! I’d never knit a triangle kerchief/shawl before. This project exposed me to shawl construction using a garter tab and increasing from the top centre out to the points of the triangle. I succeeded in using up this yarn that had been sitting in my yarn basket for three years! Another shawl project with a garter tab, centre-out construction, and also chosen to use up two more skeins I’ve had since 2015. My first Pom Pom project, my first summer garment, and my first time knitting with cotton (other than a dishcloth or placemat!) I was conservative with my gauge and so the garment ended up ever-so-slightly smaller than the fit of the sample size shown in the magazine, but I love it and I wore it a LOT this summer. I wrote a more detailed post about the process and the things I learned. This was my first-ever pair of socks, knitted with the fantastic Countess Ablaze sock yarn. These turned out so well on the first try, I couldn’t believe it, and I’ve worn them a ton since. I’ve found it’s tough to wear them for really long walking days, so I’m curious to continue trying different yarns and sock techniques. I’d love to make all my own socks and I now understand the small joy of ‘background socks’, as discussed by the lovely ladies of the Pomcast. The first thing my girlfriend asked me to knit for her! And my first pair of slippers. Always wanted to knit something with Rachel Coopey’s yarn and it has lived up to expectation. The yarn is lovely to knit with and soft. Over time, the slippers have pilled a bit, but I think this is because my girlfriend has hardly taken them off! I bought this yarn because it was just so stunningly beautiful: the bold blue colour on top of the incredible shine and lustre of the Wensleydale fleece. I didn’t really know what to do with it, but I was excited to buy my first skeins of 100% British wool. The project I initially selected for the yarn (a textured, cabled cowl) just wasn’t working out. Although frustrating at first, this yarn-pattern mismatch caused me to really think more about how to better pair a yarn with a given pattern. I’ve since learned that Wensleydale wool has very long, strong, shiny fibres – does this mean that on its own it is not well-suited for a knitted object that requires a certain squishy texture with a lot of structure and stitch definition? Perhaps? I’m still learning. I *have* heard that Wensleydale is good in a sock yarn and I am *very* interested in giving that a go. This is my first time making a Kate Davies pattern. I love her designs but have long been worried that they are too challenging for my skill level, so I was very excited to find this pattern that felt manageable for me. I enjoyed the hap-like construction (knitting the diamond lace panel first and then picking up stitches along the edge and increasing to create the garter section). I made some minor modifications to the pattern in order to use the two Wensleydale DK skeins, which worked out really well. It felt very fitting to knit Traigh in a British breed wool. I wrote more about the project in this post. My mom wanted mittens to match a lovely turquoise coat she has, and I wanted to make something really nice for her. I was taken (as were many knitters!) by the incredible Autumn 2018 ‘moon’ issue of Pom Pom, and thought that the Moondust Mitts would be perfect if I could find a fitting yarn. The Malabrigo Sock in ‘Eggplant’/’Aubergine’ had a lovely bit of sheen and were heavier on the grey than the purple. I’m finding myself more reluctant to buy superwash wool, but I care more that this gift is appreciated and practical (i.e. machine washable). It’s hard to resist Malabrigo yarns, and I appreciate their commitment to sustainability. It took me a while to come round to the idea of frogging my first attempt at a Flax sweater and trying again, but I’m glad I did. The resulting sweater actually fits. It might even be a wee bit too small, but I think I can give it a proper stretch block in the future when I have blocking mats and an apartment again! I weaved the ends in on December 31, 2018, making it my final project of the year! My Flax sweater blocking on our friends’ futon guest bed. I tried my hand at weaving on a floor loom this fall in a 2-hour introductory lesson at the London Loom and it was great! The lovely owners got me up and running very quickly and the time flew by. I can’t believe how absorbing it is. It gave me a deeper appreciation of Anni Albers’ work, which I saw at the excellent exhibition at the Tate Modern in November. I could understand why, in her 70s, she eventually stopped weaving and switched to print-making: it is labour-intensive work! Weaving sample from my London Loom workshop. I loved the neon colour options! I made a pair of Moondust Mittens from the lovely Pom Pom Magazine Issue 26 (Winter 2018) for a Christmas gift. The pattern is for fingerless mittens, which I modified to make full mittens. The yarn I chose is Malabrigo sock in ‘eggplant’ or ‘aubergine’ which is a sort of shimmery deep purpley grey. I purchased it from the lovely Yarn and Knitting (YAK) in Brighton, in October 2018. It is 100% superwash merino wool, and which I don’t love using superwash, the softness and the practicality of being able to machine wash it lends itself well to gifting it to folks who have skin sensitivities and/or are not woolly yarn nerds! The pattern was quite easy to follow. Interestingly, the ‘right side’ (outside) of the mitten is reverse stockinette (which is just the ‘wrong side’ of knitting every stitch in the round). This creates a nice background for the cables and the mitten itself is worked on the wrong side so that you can simply knit every stitch in the round. This is the first thing I’ve ever made with cables! What I learned quite quickly is that when the pattern says to hold the cable needle ‘in front’ or ‘in back’, it means in front of or behind the working needles – it is not referencing the right side or wrong side, or front or back of the work. This may be painfully obvious to folks who are very familiar with making cables, but for me this was an important discovery! The little cables look like tracks winding their way up the mitten. I really loved the fact that the cuff calls for ribbing that is made by knitting a stitch (k1) and then purling the next stitch through the back loop (p1tbl). The twist created by purling through the back loop seems to add enough tension that my ribbing is not absurdly loose (as I sometimes get when I do k1-p1 ribbing.) I think the result is quite pretty. Worked Rounds 11, 12, and 1-6 with modifications and decreases. Ready to start decreasing for full mittens! Once I was down to 20 stitches (10 stitches on each needle), I closed with Kitchener stitch. For the thumbs, after picking up stitches as per the pattern instructions, I worked around and around to a length that would be *just* before the tip of the thumb, then decreased from 16 stitches down to 4 stitches in the same manner as above (3 rounds of decreases). I left a few inches of a tail, cut the yarn, and pulled the tail through those last four stitches. I initially tried Kitchener stitch but the result was a very squared-off thumb, which looked ridiculous. I found this method to look a *lot* better. I noticed while nearing the end of the second mitten that I’d messed up some stitches quite a ways back. Thankfully, the mistakes were on the palm-side which is 100% reverse stockinette stitch and easy to repair. So I performed my first proper stitch surgery with a crochet hook and felt disproportionately proud of the accomplishment. I think they turned out pretty splendidly! This is the Riley summer top from Pompom Quarterly issue 25 (summer 2018). Ooooh I was waiting in such anticipation for this issue — so many beautiful, colourful, stripey patterns in lovely summer-weight yarns. Even though I have been a Pompom subscriber for over a year, I’ve never knitted one of the patterns for a variety of reasons worth a whole other post. Anyway, I was determined to knit something from this issue of Pompom and after some deliberation, I settled on the Riley sweater. The yarn I used is the one suggested in the pattern: Berroco Corsica. Berroco Corsica in “Shark Eye” (left) and “Cork” (right). Corsica is a 90% cotton and 10% cashmere blend and is quite lovely to knit with. I think it’s the cashmere that makes it a little more slippy (in the best possible way) than 100% cotton. The yarn is knitting up into a springy, not-too-heavy fabric. I chose Corsica because I’m still new to knitting garments and not quite up for making creative yarn choices just yet. However, I did mix it up colour-wise, choosing to knit Riley in ‘cork’ (off-white) with a ‘shark eye’ (pretty sky blue) contrast colour, rather than the sample contrast colour, clover (a gentle blush pink). Swatching for my Riley sweater with Berroco Corsica cotton/cashmere blend yarn in ‘Cork’ and ‘Shark Eye’. I’m still feeling rather nervous about how a given yarn will behave as a knitted fabric. My last garment — my first ever, the Flax sweater by Tin Can Knits — ended up *quite* a bit bigger than I had intended, despite my diligent (albeit small) gauge swatching. Bigger gauge swatches may be the way to go. A bigger swatch will let me get enough fabric to demonstrate how the weight will cause the fabric to behave and provide a better sense of how much it will stretch. I knit the Flax sweater in the yarn that the pattern called for: Sweet Georgia Superwash Worsted yarn. What I didn’t know then is that the aggressive and environmentally unfriendly process of creating superwash wool** strips wool of its natural scale, which makes the yarn ‘grippier’ and therefore less likely to grow after blocking. **I can’t believe this is something I hadn’t learned sooner. Why don’t we talk more about it?! Superwash wool is first treated with chorine gas and then coated with plastic. To learn more about this, I recommend this very informative post from Woolful.com. I first heard about the fact that superwash treatment is problematic from the wonderful ‘Crafting Consciously’ roundtable held at PomFest and shared on Pomcast 46. For the baby version of the Flax sweater that I knit for my new nephew, I scaled down the needle size and it worked a treat. Of course, baby garments are significantly smaller, so the stretch was much less of a problem. In a recent episode of the ever-delightful Pomcast (episode 52), Sophie mentions that she knitted the beautiful Tarmac top and even though she made a swatch, her linen-heavy choice of yarn translated into a garment that stretched after blocking and was bigger than she had planned. Even though I was sorry to hear about this outcome for Sophie, I was kind of heartened to hear that this phenomenon is not unheard of and can even be a problem for folks who have much more knitting experience than I do. I have typically had a looser gauge than the patterns and so scaling down my needle size is usually required. I also think that erring on the side of scaling down will help combat stretch later. Is this a thing? The Riley pattern gauge is 44 rows & 22 stitches per 10 cm achieved with US 5 needles; I went for size US 4 (3.5 mm) needles and achieved a gauge of 44 rows & 24 stitches per 10 cm (before blocking). With my swatch being slightly under-gauge width-wise, I feel less nervous about knitting a size 2 (my bust measurement + 10 cm positive ease). Pre-blocking: I’m feeling quite good about how it’s turning out. My Riley sweater at about 75% — still need to knit up the left side panel, weave in all of the ends, sew up the sides, and block! Trying the sweater on while knitting also led me to shorten the body, knitting it a few inches shorter than the pattern suggests. I actually knit up the back panel according to the pattern, then knit up the front and decided the V-neck was going to be too plunge-y at that length. So I knit the front to my desired length and then ripped back the back panel to take off 2 inches and knitted it up again to match the front. It felt so difficult to make myself rip back the back panel!! But I’m really glad I went for it. I have good knitting intuition. Like, I *knew* I shouldn’t continue without getting the length just right. Good god there were a lot of ends to weave in. Took me the better part of a train journey from Manchester to Edinburgh to do it, plus some additional time on the sofa, but in the end: all done. Off I go to block! I’m eager for blocking to give it a bit more length and looseness… although not *too* much. Yes! The sweater grew very modestly in length, relaxed a little, and developed a lovely drape. I’m so pleased that blocking did not ‘ruin’ the sweater, as I’d feared. At the National Monument on Calton Hill in Edinburgh. My Riley sweater is fully blocked, and fits beautifully! I’ve been so pleased to wear this sweater and it has proved the perfect garment for a changeable and breezy Scottish August! In which I soup up the knitting needle set and notions I inherited from my grandma to make a beautiful, compact travel knitting kit. Good thing I keep knitting shawls/scarves/neck things! Definitely don’t have enough of those. This particular, recently finished shawl/scarf/neck thing is the Age of Brass and Steam Kerchief knitted in a stash skein of Malabrigo Arroyo yarn. Finished up this adorable Tin Can Knits Flax sweater just before the birth of a new little nephew, and OMG how are humans ever this tiny??! “Flax” is a great, simple top-down raglan sweater. The pattern is free and comes in SO MANY sizes. The sweater I knit is the smallest size. The yarn is Sweet Georgia Superwash Worsted in the Vancouver-appropriate colour “Deep Cove”. Tiny Flax sweater with completed seamless body and arms on scrap yarn ready to pick up and knit. 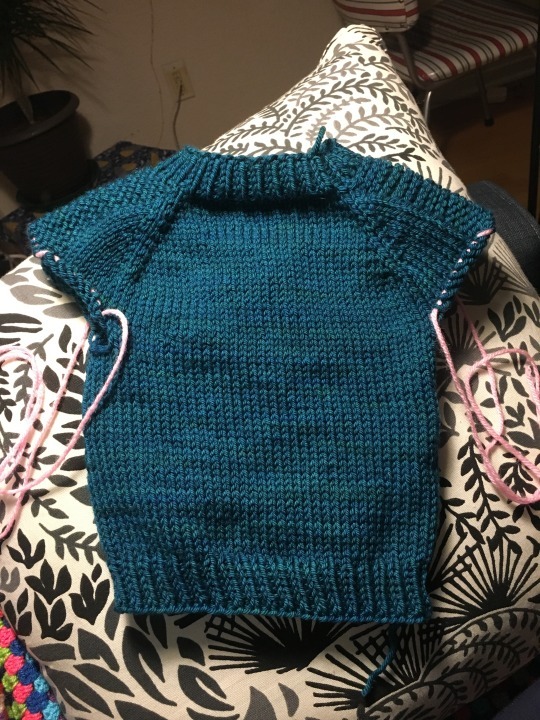 Even though I made & blocked a swatch in preparation for the adult Flax sweater, I did not anticipate how much the weight of the garment would cause it to sag. I have frogged it and will reattempt. This tiny Flax worked out really well with smaller needles, so I feel ready for round 2 of the adult-size sweater.